At the Garza Law Firm, PLLC, we accept auto accident and personal injury cases of all sizes, and give each one the full support, and personal attention of our legal staff. We follow every reasonable lead, hire the best available investigators, and utilize the most current and innovative technology to give you the edge in pursuing the best possible outcome for yourself or your loved one who has been injured in a car wreck, motorcycle accident, truck accident or other serious personal injury accident. 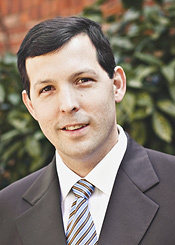 ersonal Injury Lawyer Marcos M. Garza is from Athens, Tennessee. After receiving his law license in 2001 and serving a tour as a judge advocate in the United States Marine Corps, Mr. Garza returned to his home in east Tennessee to engage in the practice of personal injury and criminal defense law. Mr. Garza is a graduate of Vanderbilt University, the University of Tennessee College of Social Work where he obtained his Master’s degree, and a graduate of the University of Tennessee College of Law. Mr. Garza is committed to carefully selecting fewer cases in order to achieve his commitment to providing outstanding service and achieving superior results for his clients. In order to stay current and on the cutting edge of developments in the law, Mr. Garza is actively involved in several organizations committed to the representation of individuals with personal injuries and those individuals who may be accused of a crime. Mr. Garza is Board Member of The Tennessee Association for Justice, and a member of the American Association of Justice – two organizations committed to representing plaintiffs. Additionally, Mr. Garza has additional trial experience gained from his representation in criminal matters and is a Life Member of the National Association of Criminal Defense Lawyers and a Life Member of the Tennessee Association of Criminal Defense Lawyers, and the National College of DUI Defense. Personal Injury Lawyer Marcos Garza is licensed to practice in both Tennessee State and Federal Courts, The Sixth Circuit Court of Appeals, and in the United States Court of Appeals for the Armed Forces. During his free time, Mr. Garza enjoys running, spending time with his wife and three young children, and charcoal grilling on his Big Green Egg.